Each week Merri-Mac gathers at the teepee. Legends are read, awards are given and handprints are left on standards. We do this because we think it is important to recognize growth in our campers, and equally important that they recognize it in themselves. It is important because we are made to live life together, to be challenged, grow and succeed, and to engage our world. These things are always best learned in families, but we believe they are next best learned at camp. We also believe that the things that happen at camp help girls grow and so we have designed our White Feather program to lay breadcrumbs on the trail for growth at camp. As part of White Feather girls accumulate “marks” based on activity achievements, elective challenges (solo backpacking trips, two-match fires, running Tomahawk Trail, etc.) and cabin leadership. Each mark takes them a step closer to their next “promotion” and toward the highest rank of White Feather. With each mark and each promotion girls receive pins and necklaces, which we encourage them to keep on their camp pennant. The result is that through their years they will build a record of their camp accomplishments. In the end the most important part of Merri-Mac Council comes after the ceremony is over. 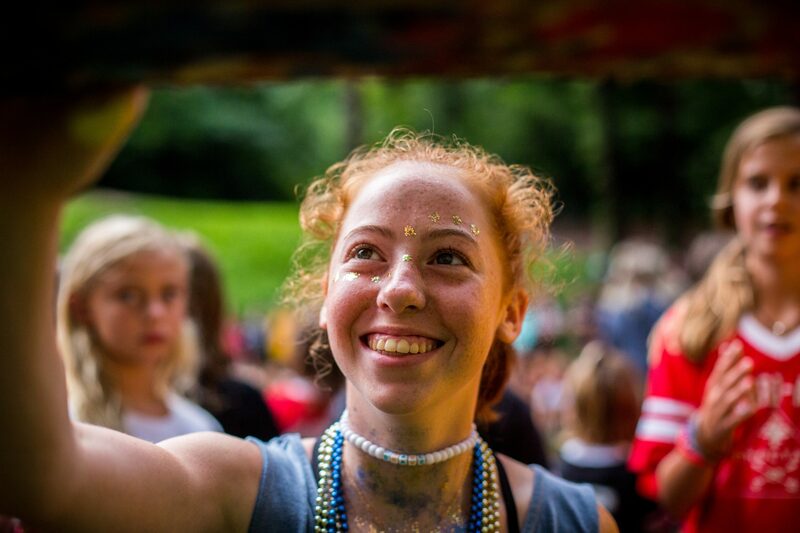 During cabin time on the evenings that we hold council the counselors will go to each camper to describe the gifts and abilities that they have noticed in her. This is where a girl who may never earn a White Feather Promotion, or a Gold Bar, or be elected to a tribal office, can be told about what we see God doing in her life and her and her contribution to the camp family. Blue Heaven – Riley M.
Cloud Nine – Gabby K.
Comet- Gabrielle A., Anna K., Clarissa S. & Gemma W.
Dreams Begin – Lizzie H. & Nora Q.
Jiggity Jig – Grace M. & Ashley S.
Rainbow- Elizabeth W., Claire H., Kennedi G. & Gretchen N.
Big Dipper – Evy V. & Caroline D.
Blue Heaven – Ashley P. & Aimee U. Cloud Nine – Jillian C. & Elizabeth H.
Comet- Gabby A. & Abby F.
Cross Patch – Julia W. & Josie M.
Dreams Begin – Maddie L. & Lizzie H.
Dreams End – Caroline K. & Lauren P.
Happy Hollow – Zoe K. & Camille S.
Jiggity Jig – Ashley S. & Zadie H.
Jiggity Jog – Lacey C. & Bailey C.
Little Dipper – Clare M.
Moonmist – Amelia C. & Stella G.
Rainbow – Olivia W., Norah M. & Mina D.
Stardust – Mae R. & Zoe H.
Sun Drop – Johanna R. & Sophia T.
Sunnyside – Heather C. & Glory W.
The Robin – Brooke G. & Frances L.
Tweedle Dee – Violet C. & Dylan C.
Tweedle Doe – Caroline B. & Evie B.
Tweedle Dot – Ansley C.
Tweedle Dum – Claire L. & Kendall B. Up Yonder – Emmy L. & Anne M.
Big Dipper – Cate L. & Olivia S.
Blue Heaven – Riley M. & Breland B. Cloud Nine – Gabby K. & Amy W.
Comet – Anna K. & Sabrina R.
Cross Patch – Annabeth M. & Eva B. Dreams Begin – Maddie L. & Molly M.
Dreams End – Virginia C. & Izzie O. Happy Hollow – Zoe K. & Reagan B.
Jiggity Jig – Ashley S. & Madge M.
Jiggity Jog – Lacey C. & Sadie M.
Little Dipper – Margaret S.
Milky Way – Callie S. & May L.
Moonmist – Addison K. & Maryann A.
Rainbow – Olivia W., Gretchen N & Mina D.
Stardust – Isabella S. & Nikki F.
Sun Drop – Johanna R. & Mary Mac N.
Sunnyside – Heather C. & Caroline M.
Sun Spot – Blair R.
The Robin – Brooke G. & Shea P.
Tweedle Dee – Lily M. & Anna Katherine B.
Tweedle Doe – Miller B. & Harper V G.
Tweedle Dot – Cora A.
Tweedle Dum – Georgia H. & Isabel P.
Up Yonder – Spencer C. & Ella M.
Dance- Ashley P. & Norah M.
Drama- Caroline K., Lindsay J., Gemma W., Lizzie H., Olivia N., Anna S., Clarissa S. & Paige R.
Ews- Patterson G., Hannah F., Claire H., Hailey F. & Adeline G.
Swimming- Caroline D., Libby M., Gabby A., Olivia N., Annabeth M., Maddie L. & Adeline G.
Tennis- Rhodes R., Grace R., Carolyn C. & Kennedi G.
Volleyball- Coco M. & Gabby K.
Arrow: Lacey C., Stella J., Emma L P., Ashley S., Julia W., Elizabeth G., Zoe K., Grace M. & Davies S.
Crazy Creek: Clare M., Blair R., Claire N. & Mar R.
Running Deer: Olivia N., Gemma W., Amy W. & Caroline D.
Red Tail: Gabrielle A., Kennedi G., Gabby K., Olivia W., Caroline D., Christina J. & Rhodes R.
Junior Feather: Adeline G., Maddie L., Gretchen N., Lizzie H. & Riley M.
White Feather: Virginia C., Patterson G., Hailey f. & Caroline K.
Merri-Mac forever in our hearts!The best summer!